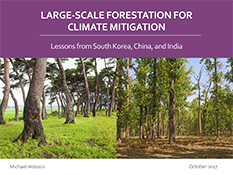 How much forest expansion and climate mitigation has been achieved through large-scale A/R/R efforts? At what cost? How successful have large-scale A/R/R efforts actually been as mitigation tools? Are there information and reporting gaps that hinder assessment of forestation’s potential role in climate mitigation? Overall, this study suggests that large-scale A/R/R should be taken seriously as a major focus for additional climate mitigation action around the world. It suggests that A/R/R goals in a climate context should be outcome-based (e.g. area of forest expansion, volume change in forest stock, tons of CO2 sequestered) rather than input-based (hectares planted or restored, trees planted), and linked directly to the forest carbon statistics that countries tracks in national forest inventories and use for compiling GHG inventories. The paper also demonstrates that three countries have achieved very significant forest turnarounds and tree planting, yielding mitigation of over 12 GtCO2 in the past two decades. Such large-scale sequestration may be replicated, under the right conditions, thereby contributing to Paris Agreement goals. Funding for this report has been provided by the Climate and Land Use Alliance. The author is solely responsible for its content. Wolosin, M. (2017). 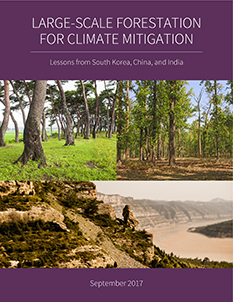 Large-scale Forestation for Climate Mitigation: Lessons from South Korea, China and India.